Whether you are a pilot or an aviation enthusiast, MARQ™ Aviator is here to champion your spirit of flight in every way. It is the luxury modern tool watch to guide you anywhere life leads. Smart features, the worldwide aeronautical database and Direct-to emergency navigation make it so, while detailed NEXRAD weather radar and Garmin avionics integration ensure you’re always in the pilot’s seat. 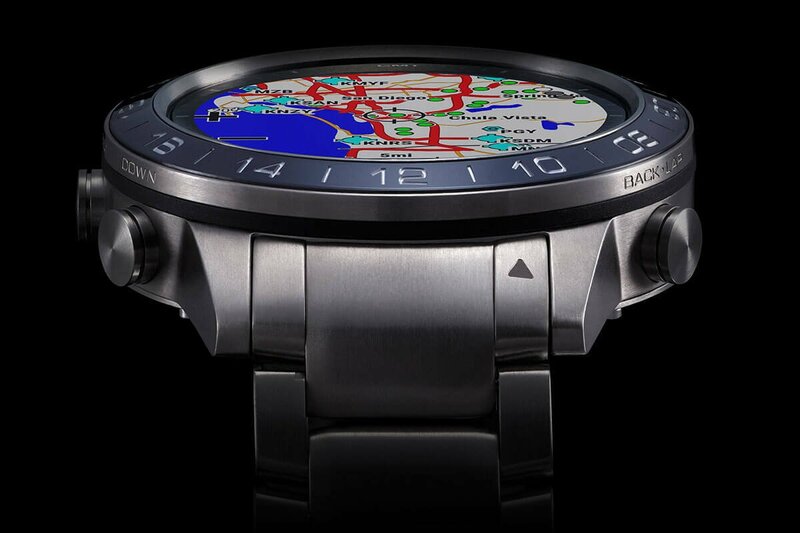 A mirror-polished 24-hour GMT bezel and two additional time zones record your extensive travels. And the luminous, swept-wing titanium bracelet fits with precision — even when times are turbulent. With each takeoff, it shows where you’re headed. Along the way, it shows you’ve arrived. The classic design of MARQ Aviator pays homage to pilots everywhere. 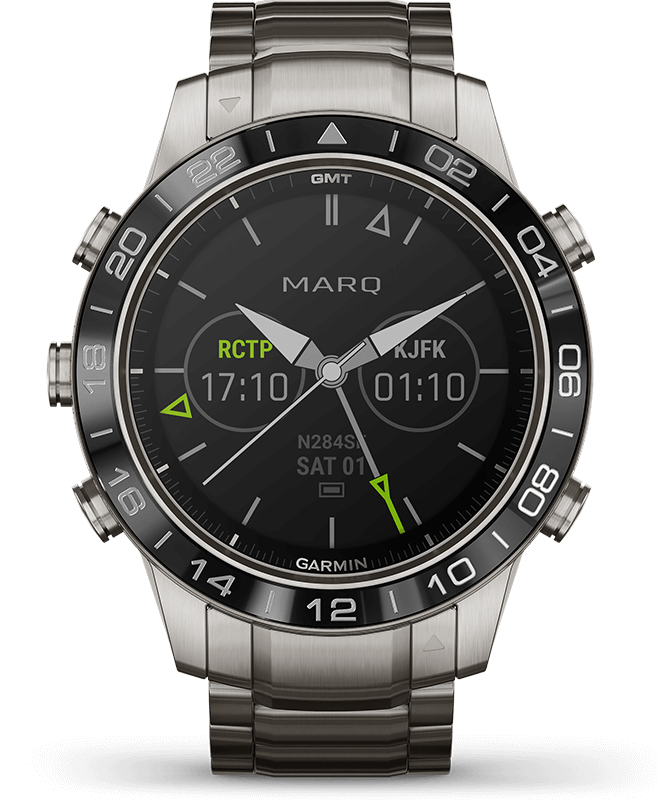 Preloaded with a worldwide aviation database, MARQ Aviator contains airport locations, navigational aids and radio frequencies. An emergency access button hot key quickly activates a path to the nearest airport. Estimated time en route automatically shows how long to your destination. Directional arrow and track displays a simple pointer to the next waypoint. For the modern aviator, the form and function aren’t just comprehensive — they are revolutionary. 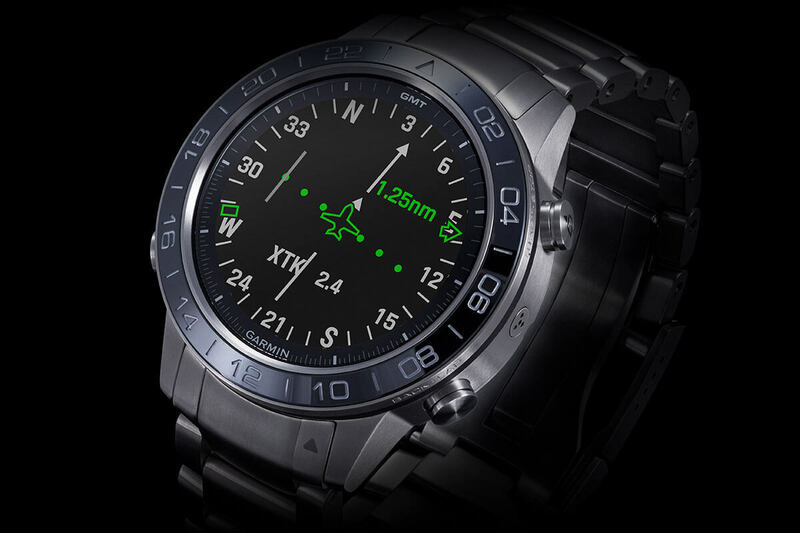 The horizontal situation indicator is a visualisation of aviation heritage, offering a simple view to know if you’re on the correct course. With the ability to see your current track relevant to the flight plan, an off-course indicator with points of deflection, compass heading as well as the distance to the next waypoint, the path forward has never been clearer. 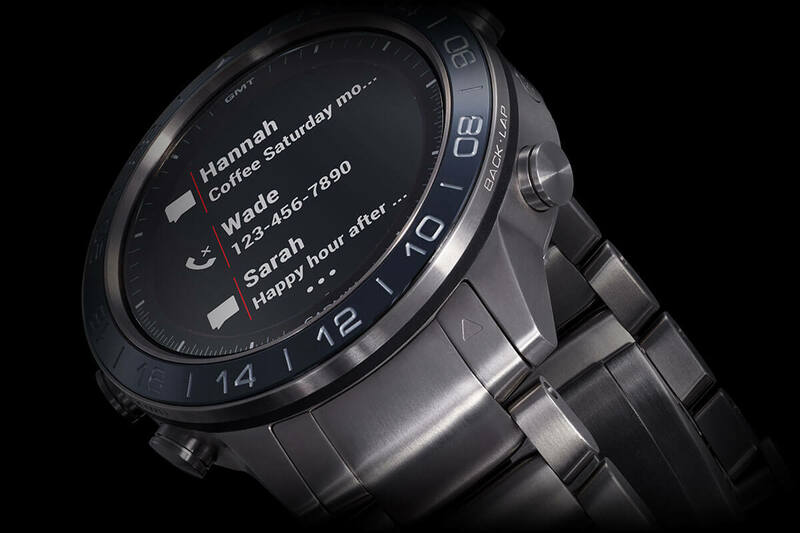 Precision markings are laser etched onto the 46 mm ceramic bezel, which is then coated with a thin layer of metal and polished to a mirror shine. The swept-wing titanium bracelet leads to a security clasp that micro-adjusts for a premium fit. All-day stress monitoring1. Emails, texts and alerts2. Music storage and streaming services, such as Spotify®3. MARQ Aviator is even equipped with Garmin Pay™ contactless payments4 so you can make purchases by simply waving your wrist. It is yet another opportunity to show your passion for flying high — while enjoying the modern conveniences of the latest connected features.